Sirius is a first magnitude star (HR 2491 HD 48915 Flamsteed Number: 9 Bayer Letter: Alpha) in the Constellation of Canis Major, with a visual Magnitude of -1.46. Sirius is also known as Canicula; the Dog Star and Aschere. Sirius is 2.01 times the size of the Sun and the brightest star in our heavens. The heliacal rising of the dog star signalled the most searing heat of the Summer, hence the term ‘dog days.’. The star is most easily found by tracing the belt of Orion downwards. 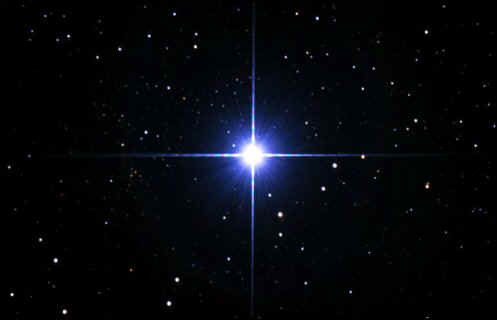 Sirius is a binary star with a white dwarf companion, Sirius B. This “pup” is an eight-magnitude star, separated from Sirius by a couple of arc seconds. This makes it exceedingly difficult to see in a telescope because of the great brilliance of Sirius. Manilus writes of Sirius (the Dog) as one who “will fashion unbridled spirits and impetuous hearts; it will bestow on its sons billows of anger, and draw upon them the hatred and fear of the whole populace. (The impetuosity of the speaker causes him to utter words before he has time to adapt them to grammar or logic). Their hearts start throbbing at the slightest cause, and when speech comes their tongues rave and bark, and constant gnashing imparts the sound of teeth to their utterance. Their failings are intensified by alcohol, which gives them strength and fans their savage wrath to flame. No fear have they of woods or mountains, or monstrous lions, the tusks of the foaming boar, or the weapons which nature has given wild beasts; they vent their burning fury upon all legitimate prey. Lest you wonder at these tendencies under such a constellation, you see how even the constellation itself hunts among the stars, for in its course it seeks to catch the Hare in front.” ( Liber V Astronomica, lines 206-233). See original Latin text. Sirius has always been considered a very important star, and it was watched diligently. It is also one of the primary stars of navigation. The importance of calculating the heliacal rising and setting of Sirius was recognized in Ancient times and is still relevant today . The table below shows the anticipated times of the heliacal rise and set dates in three locations over a span of 2800 years. As is true of any star, Sirius is only visible between the time of its helical rising and setting. Conversely, it is invisible from the time of heliacal setting until its heliacal rising. The “heliacal rising” is the first day when the star rises and the Sun is far enough below the eastern horizon to make it visible in the morning twilight. In the same way, the “heliacal setting” is the last day when the star sets and the Sun is far enough below the western horizon to make the star visible in the evening twilight. This in not to be confused with what is called “cosmic rising”. In the latter case, it is not possible to see the star, due to the light of the Sun. Because the magnitude and brilliance of stars differ considerably, their heliacal risings and settings occur with different altitudes of the Sun below the horizon (this is called in Latin “arcus visionis” of the star). For example, the Sun’s altitude which makes Sirius visible (-7°) is quite smaller than the altitude (-11°) that allows Antares to be visible in the early dawn or twilight sky. This is because Sirius is brighter than Antares and can therefore be seen in a lighter sky. 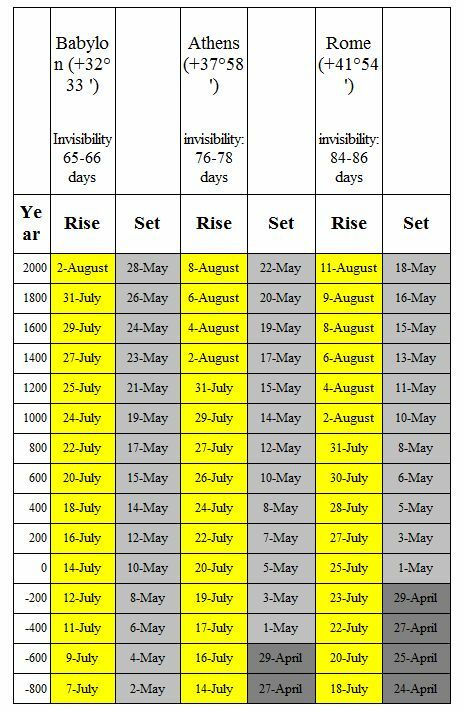 However, this table serves as a very close approximation of the periods of the first and last dates of the visibility of Sirius in relation to the horizon. It is oriented from the horizon (height 0°), with the Suns place to a negative height of 7°. It may be difficult for many contemporary astrologers to understand the phenomena of first and last visibility of a celestial body. This is due to the unfortunate modern divorce of astrology from her sister science, astronomy. In ancient and Classical astrology, no such divorce had occurred and the heavens were watched very closely. The sky maps below are designed to help illustrate the concept of heliacal rising more clearly. Sky map 1 was generated using SkyChart software, set for sunrise in Rome, 08 August 2000. 6:19 am. The red line is the local horizon. The Sun is seen at the far left. Sirius is the bright star in the constellation Canis Major. Note that the Sun is on the eastern horizon, but Sirius is still not visible in the morning twilight. Sky map 2 is for the same date and location, at 05:38:01 am, which is the precise time of the rising of Sirius. Sirius is seen ascending on the eastern horizon, but is still not visible due to the morning twilight. Sky map 3 is set for one day after the anticipated date of the heliacal rising of Sirius in Rome according to the table, on 12 August 2000 at 3h34m UT — 4:31am LMT. This is the precise time of the heliacal rising of Sirius, seen rising on the eastern horizon. The star is visible because it has cleared the necessary -7 negative height of the Sun, for the first time after approximately 3 months of invisibility This is the true heliacal rising of Sirius for the date given. On the anticipated date of 11 August, the Sun’s altitude is only -6°52’, and we cannot be sure of the visibility of Sirius. She’s rising just before the Sun on 08 August. Visibility depends on atmospheric conditions, such as haze or pollution.